USES: To make tortillas, tamales and the base of other snacks. FINDING: Tortilla factories and some Mexican groceries (especially on weekends). CHOOSING: Fresh corn masa typically comes in two grinds, smooth and coarse. 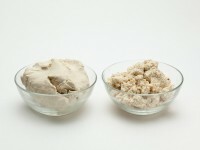 Smooth-ground masa is used for tortillas and practically all other dishes, except certain tamales, for which coarse-ground masa is preferred. STORING: Smooth-ground masa makes the best tortillas when freshly ground, kept at room temperature, well covered, and used within 12 hours. Though the tortillas will be a little heavier, the masa may be refrigerated, well covered, for a day or two. For all other uses, it may be refrigerated for 3 days. Coarse-ground masa may be refrigerated, well covered, for 3 days; it may also be frozen for up to 3 months.